"Are we cops or a chicken joint?" CJ Entertainment has debuted an official US trailer for an action comedy titled Extreme Job, made by South Korean filmmaker Lee Byeong-heon (Cheer Up Mr. Lee, Twenty, What a Man Wants). The goofy comedy is about a team of narcotic detectives who goes undercover inside a fried chicken joint to stake out an organized crime gang. But things take an unexpected turn when the detectives’ chicken recipe suddenly transforms the rundown restaurant into the hottest eatery in town. Starring Ryu Seung-yong, Lee Hanee, Jin Sun-kyu, Lee Dong-hwi, and Gong-myoung. I'm happy that CJ brings these Korean films to the US and puts them in theaters at the exact same time they're available in Korea, without a delayed release. Though I'm not sure I can say this one is really worth going out and seeing. Enjoy. A team of narcotics detectives goes undercover in a fried chicken joint to stake out an organized crime gang. But things take an unexpected turn when the detectives' chicken recipe suddenly transforms the rundown restaurant into the hottest eatery in town. Extreme Job is directed by Korean writer / filmmaker Lee Byeong-heon, director of the films Cheer Up Mr. Lee, Twenty, and What a Man Wants previously. The film is presented and distributed by CJ Entertainment, and produced by About Film. For more info & release details, visit the film's official website. 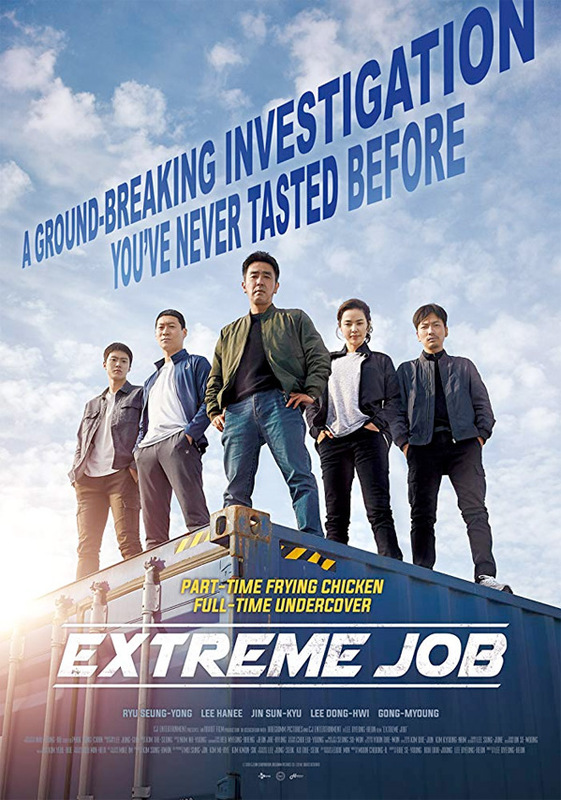 CJ Entertainment will release Lee's Extreme Job in select US theaters starting January 25th, expanding wider on February 1st coming up. Anyone interested in this?